A Senate probe into a stalled project involving the acquisition of two brand-new Philippine Navy warships is being mounted seemingly on the back of sensationalised news of dubious quality. A report published by Rappler created a huge brouhaha after it alleged that Special Assistant to the President Christopher “Bong” Go “intervened” in a multibillion-peso agreement between the Armed Forces of the Philippines (AFP) and a South Korean firm contracted to build two warships for the Philippine Navy. The firm. Hyundai Heavy Industries (HHI) had post-qualified for the order for two brand-new frigates after it had lodged the lowest and most responsive bid to build them. However, a dispute between HHI and the Philippines’ Defense Acquisition Office (DAO) over selection of the supplier of the ships’ command management system (CMS) stalled the project. The Rappler report alleges that “in the first week January 2017, Go gave Defense Secretary Delfin Lorenzana a white paper expressing preference for Hanwha Thales, another South Korean company, to provide the CMS.” Yet an account of the transaction provided by another source document shows that the original dispute between HHI and the DAO involved a position asserted by HHI that, as the lead contracted shipbuilder, it has the right to make independent representation and negotiation with CMS suppliers so long as the resulting agreed delivery specs meet the requirements of the Philippine Navy. Under that principle, HHI had already indicated a preference for Hanwa System Korea (HSC) over Thales Netherlands (TNL), the latter having also been evaluated by HHI. HHI asserts that it is common practice, particularly when tight budgets are involved, that the lead shipbuilder be given latitude to act in “good faith” that any agreement it makes with with subcontractors will result in all of the customers’ technical and commercial conditions being met. The short of it is that it is likely that HHI had already eyed HSC as its preferred CMS supplier in late 2016. The Rappler report offered no substance to the claim that Go “intervened” other than that he just happened to be the person mentioned by Defense Secretary Delfin Lorenzana in a note he attached to a “white paper” that he sent to then Philippine Navy chief Vice Admiral Ronald Mercado. The purported “white paper” supposedly gave a “glowing endorsement” of HSC and “trashed” the Dutch company TNL. Even more interesting, Rappler referred to the whitepaper as “Go’s white paper” without being explicitly specific with regard to who or what actually authored or originated it. However, some source documents show that this “white paper” may have just been part of documentary evidence submitted in June 2016 in relation to the post-qualification of HHI which included a “Weapons, Sensors, and Combat Management System Report” prepared by and signed by senior Philippine Navy officers involved in the project. Indeed, information from other source documents indicate that the “white paper” could have been actually prepared by HSC and somehow had found its way to Lorenzana who could have merely assumed it came from Go. Either way, Rappler does not provide any compelling factual evidence to support its “Go’s white paper” allegation or, at the very least, propose an alternative theory to account for Go’s name being mentioned by Lorenzana considering that Go has denied on record his involvement in the project. Either way, nothing in the facts surrounding this brouhaha or even the factoids cooked up by Rappler points to any actual wrongdoing on the part of any characters (actual or imagined) in this story. It seems that in her zeal to find another speck of dust to screech about in the administration of Philippine President Rodrigo Duterte, Rapplerette Carmela Fonbuena who authored this sloppy excuse for “journalism” may have cut corners big time. That sloppy journalism is certainly costing Filipino taxpayers big time too as it could potentially contribute to stalling a vital project even further and launch many more pointless Senate “probes” on the matter. What Rappler has essentially done was invite actual intervention into the frigate deal on the basis of a purported “intervention” Fonbuena may have simply concocted within her pointed head. Next Article Does anyone have the right to tell Liza Soberano how “Filipino” she is? Rappler and other Aquino Cojuangco political axis aligned media, will continue to give Fake News, to obstruct the governance of Pres. Duterte. They want the phony and fake Vice President Leni Robredo , their puppet, to take over. They will continue ro dig dirt, real and imagined; and expand these “small dirt” to the largest possible size, as Fake News. Rappler has already lost its credibility, as the “Destroy Duterte Media.” All these Fake News media and opposition aligned media will surely concoct Fake News , to destroy Pres. Duterte’s presidency. What Bong Go said in the hearing is probably why the issue was cooked up– “Perhaps to derail security measures and make the government fail.” There’s also something off when SND Lorenzana did not confirm if the note really came from Bong Go at the time. That in itself is a highly irregular detail. After all, the issue was conjured around that “white paper”. And then of course, Trillanes was once again given the stage that it was as if he had the credibility to present the case. 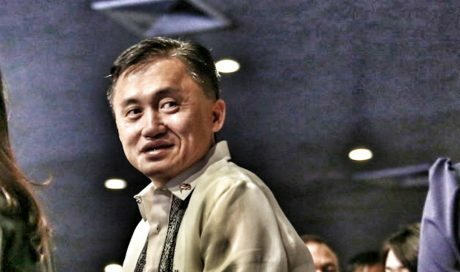 The Senators are sure accommodating to him while appearing “supportive” of (SAP) Bong Go and the President. And the way they do their job reveals more than what they would like to project.